SEOUL, June 29 (Yonhap) — Hwang Jae-gyun of the San Francisco Giants has homered for his first hit in Major League Baseball (MLB). 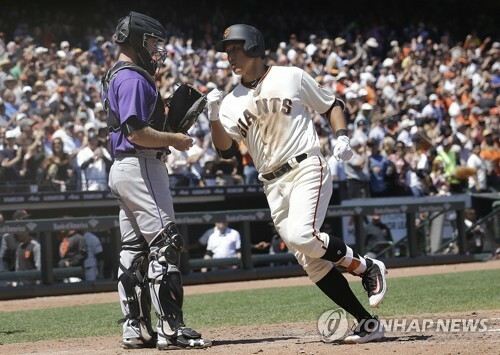 The South Korean third baseman, called up by the Giants prior to the home game against the Colorado Rockies on Wednesday (local time), hit a solo home run in just his third at-bat in his first big league game. With the score tied at 3-3 with two outs in the sixth at AT&T Park, Hwang, batting fifth, took Colorado starter Kyle Freeland over the left field wall for a tie-breaking shot. He’s the first South Korean major league player to homer in his first big league game. He also became the fastest Korean player to blast his first career home run. Two other players, Minnesota Twins’ Park Byung-ho and former Seattle Mariners first baseman Lee Dae-ho, each homered in their third big league game last year. Hwang recorded his first major league RBI in his second at-bat in the fourth inning, with a comebacker to Freeland. With the men at the corners with one out in the fourth, Hwang hit a bouncer back to the pitcher, who had the ball go off his glove and only had the play at first when he fielded the ball. That allowed Joe Panik to score from third, as the Giants cut the deficit to 2-1. Hwang grounded out to third in his first at-bat and struck out in his final at-bat. The Giants went on to down the Rockies 5-3. The 29-year-old signed a split contract — different salary rates for time spent in the majors and the minors — with the Giants in January, having turned down a more lucrative offer to stay in the Korea Baseball Organization (KBO). Despite leading the club in RBIs in spring training and being voted the team’s best rookie, Hwang failed to make the Opening Day roster and toiled in the Triple-A Sacramento for a few months. Hwang said the home run felt “unreal,” after what he’d gone through just to get to the majors. Hwang had an opt-out clause in his contract that would allow him to declare free agency if the Giants didn’t promote him by July 1. Earlier this week, Hwang expressed his intention to exercise that right without a call-up. The Giants had a sudden need for an extra infielder when third baseman Conor Gillaspie went down with lower back pains. They placed him on the disabled list and brought Hwang up to the major leagues for the first time for Wednesday’s tilt. Hwang sought to make it to the majors first in the winter of 2015. He put himself up for posting, whereby major league teams would put in a bid in a silent auction for an available player. Hwang didn’t attract any bid at the time, becoming just the third KBO player to fail to draw a bid in the posting. Hwang had just enjoyed his most productive KBO season, with career highs of 26 home runs, 97 RBIs, 95 runs scored, 41 doubles and a .521 slugging percentage. After the humiliation in the offseason, Hwang returned with a vengeance and had an even better season in 2016. He turned in a .335/.394/.570 line, with 27 home runs and 113 RBIs, all of them new career highs. He swiped 25 bases and cut down on strikeouts from 122 in 2015 to 66 in 2016.